Cox Air Care launched in 1989 and has been accident-free for over 30 years of service. We operate two MD 902 Explorers 24/7 from bases at Cox South in Springfield and at Citizens Memorial Healthcare in Bolivar, Missouri, proudly transporting critically ill and injured patients throughout southwest Missouri and parts of northwest Arkansas. 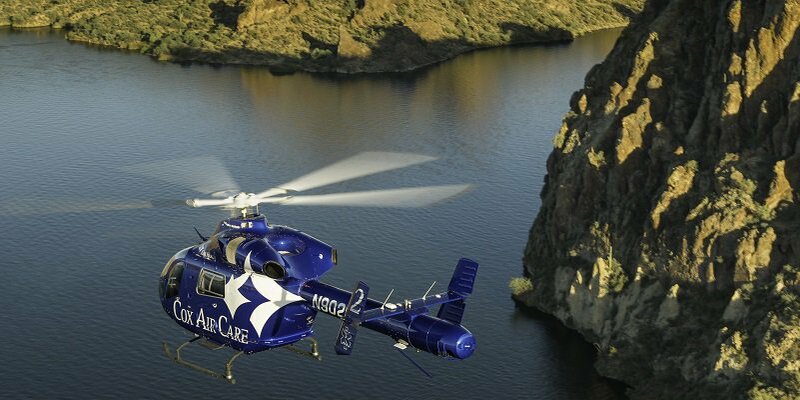 Each helicopter team is fully staffed with flight nurses and paramedics, in addition to highly experienced pilots. We’re the only air medical flight program physically based in Springfield and were the first in southwest Missouri to become accredited by the Commission on Accreditation of Medical Transport Systems (CAMTS). CAMTS is a non-profit organization dedicated to improving the quality and safety of medical transport services. Accreditation is voluntary and includes the evaluation of patient care and safety. At Cox Air Care we pride ourselves on safety, and we wouldn’t be able to achieve any mission without the maintenance staff, pilots, communication specialists and medical crews all working as a team. Cox Air Care is operated in partnership with Air Methods Corporation. Learn more about our experienced team of highly trained flight nurses, paramedics, PRNs, pilots and ground crew professionals. Get answers to your questions about the Cox Air Care program here.